apprentices having to currently complete 5 arches requiring trade school attendance – the proposal is to reduce this to 4 – should this be reduced at all or become an elective unit? Apprentices not being taught enough of the traditional techniques versus apprentices being taught too many traditional techniques – think fireplaces, number of different types of bonds, decorative elements. The change in qualification name to Certificate III in Bricklaying/Blocklaying and Paving (note: paving units will be electives and not core subjects). Trade schools are audited by a dedicated government body to ensure that all parts of a training package are correctly being trained. What is being proposed in these changes will affect every bricklaying apprentice in the country. If you feel that there are gaps in training or a focus on the wrong types of skills, this is your chance to make a difference! As always, if you would like to have a chat about these changes, or ask questions, feel free to contact us at 0883675615 or email info@fcta.com.au. Employers and apprentices frequently ask us about their pay rates. How much you get paid is a hot topic at trade school! To help out, we have utilised the FairWork Ombudsman’s Pay Rate Tool. This is a free resource and I encourage anyone referring to this page to check their rate themselves. Please note THIS IS A GUIDE ONLY. Pay rates and allowances can change depending on personal circumstances. A new article in The Advertiser today reports on the decline in the number of apprenticeships. Despite this, we have a huge demand from employers wanting to hire apprentices. The biggest obstacle seems to be the number of under 21’s who either do not have a drivers license or have lost their licenses. The Government needs to consider reversing the policy that requires people to be on their ‘L’ plates for 12 months. Along with this, the loss of a drivers license can result in being completely excluded from working in the building and construction industry. Using public transport to get to different job sites, some of which are located in new suburbs without any infrastructure – is not practical or even possible most of the time. 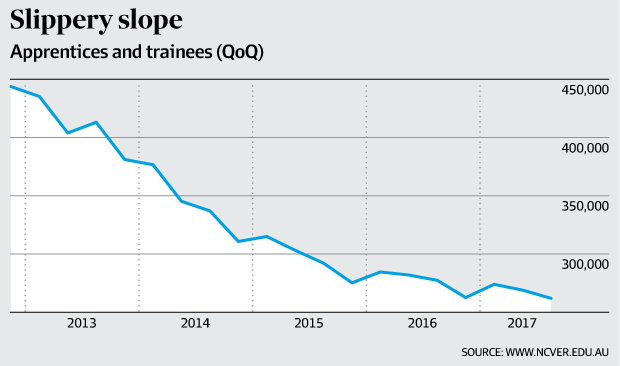 THE number of traineeships and apprenticeships being undertaken in South Australia has continued to decline, a new report shows. South Australia’s Training and Skills Commission 2017 Annual Report, tabled in State Parliament on Tuesday, showed last year there were 15,700 apprentices and trainees in training from 17,100 the year before – an 8.2 percent drop. An estimated 6100 apprentices and trainees successfully completed their training contract in the 12 months between July 1, 2016 and June 30, 2017 – again down from the year before when there was 6700 – a drop of 9 percent. 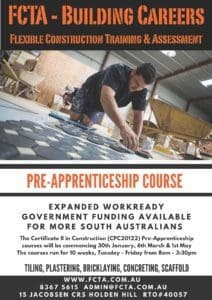 In the report, Commission chair Michael Boyce said SA has followed a national trend.“Apprenticeship and traineeship activity has declined nationwide since July 2012 due to multiple factors,” Mr Boyce said.“The significant decrease in traineeship activity was primarily driven by the removal of almost all funding to employers for employing existing workers under the Australian Government’s Australian Apprenticeships Incentives Programme.“Challenging economic conditions reduced apprenticeship commencements between 2012-13 and 2015-16.“However, the impact of these changes has lessened in the past three years, with preliminary data indicating apprenticeship commencements have stabilised, while the decline in traineeship commencements has slowed.”The new State Government has promised $100 million over the forward estimates to create 21,000 new apprenticeships or traineeships in SA. 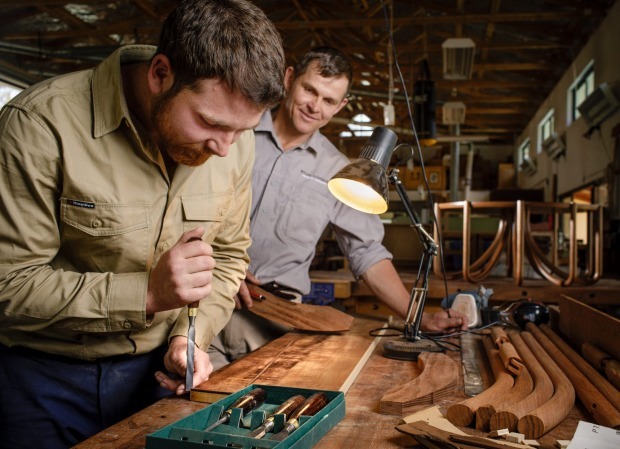 Last month The Advertiser revealed the new program to expand skills training for young people in SA will start from July, despite ongoing negotiations to unlock $100 million in crucial federal cash. 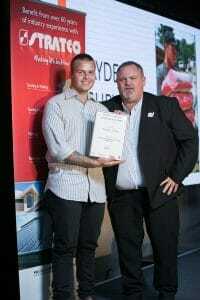 Big congratulations to Haydon Ashby, of Semaphore South, South Australia, for being awarded Apprentice Bricklayer of the Year 2017 in the HIA-Stratco state annual Apprentice & Trade Contractor Awards, held recently in Adelaide. Haydon is now in his third year, employed by HIA under a Group Training Organisation (GTO) arrangement where his host employer is Michael Quaini bricklayer based in Cowandilla, Adelaide. Haydon started work with Michael in early 2016 and has proven through his diligence and skill to be a worthy recipient of this award, as judged by field officers employed by HIA. There was only one bricklaying Award made by HIA and sponsor Stratco, covering all bricklaying apprenticeship years, so it is a strong recognition of effort to have achieved this award – well done Haydon! I attended the event and on behalf of Australian Brick and Blocking Foundation (ABBTF) and presented this important award to Haydon. It was an honour and a pleasure to see SA’s apprentices from several trades, receive acknowledgement for their strong performances. 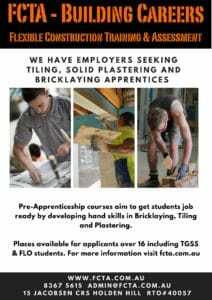 If you’re considering an Apprenticeship in SA check out your options at FCTA, TAFESA. Also visit Become-a-Bricklayer for information on how to explore bricklaying in your State and much more. Just a bit more information on the role of Group Training: For bricklayers not wanting to directly employ an Apprentice, Group Training is an excellent way to introduce new apprentices into your business without carrying the administration with the GTO employing and training the apprentice. 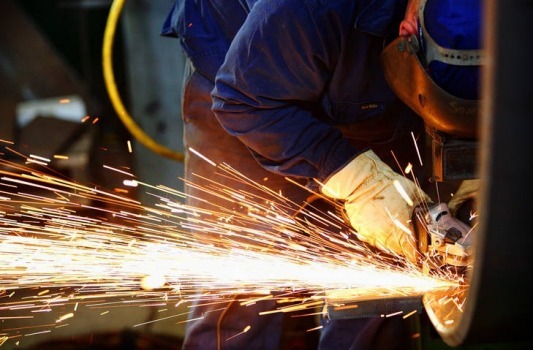 The host employer is a tradesperson who provides actual onsite training and as such pays the Group Training company a fee for the time that the apprentice spends onsite. There are advantages to this arrangement. For example some tradespeople want apprentices but do not want the responsibility of accruing or paying holiday pay, sick leave, and superannuation or training costs as such. 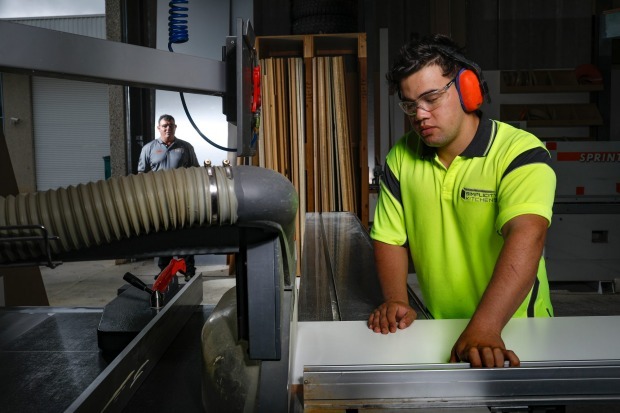 Some tradesmen do not want the direct responsibility of overseeing the offsite training component and coordination of their apprentices to attend a local Training Provider (RTO), such as TAFESA, as part of the Certificate III completion. And some feel they may not have long term work and cannot sustain an apprentice for three to four years. For apprentices it’s an alternative pathway to direct employment with a bricklayer, providing them instead with a ‘host’ employer while being employed by the GTO, in this case HIA. GTO vs RTO explained. A YOUNG plumber was only paid one-fifth of what he was owed. When he asked his boss about it, all he got was abuse. A MAN who told his employee to “seriously, f**k off” after the worker complained about being ripped off has copped a hefty fine. Michael Patrick Pulis was slugged with a $21,500 penalty, while his company, Pulis Plumbing Pty Ltd, was hit with a further $100,000 fine. Judge Grant Riethmuller found the employee — a 20-year-old plumber’s labourer — had been underpaid by $26,882 for work done in Melbourne, Geelong and Bendigo in Victoria over a period of just three months in late 2014. Judge Riethmuller slammed Mr Pulis for his “outrageous exploitation of a young person” and said his conduct had been “nothing short of avarice”. Mr Pulis paid the man an apprentice rate of just $12.18 per hour despite not having actually signed him up as an apprentice — which meant he was entitled to a far higher hourly rate of $37.08 for ordinary hours and up to $74.16 an hour for overtime. Because the Fair Work Ombudsman had previously warned Mr Pulis that labourer rates must be paid unless an apprenticeship arrangement was formally registered, Judge Riethmuller found the underpayments had been deliberate. The worker had only been paid one-fifth of what he was entitled to, and he also missed out on meal and travel allowances as well as leave and termination entitlements. The employee worked 10- to 12-hour days and was never given feedback about his work, however, after three months on the job Mr Pulis told him his skills were not at a second-year apprentice level. “The conduct is worse than simply underpaying an employee who has had difficulty obtaining work elsewhere, as the respondents also held out the lure of an apprenticeship to this young man: a particularly significant career and life goal for a young person who is not academically inclined,” Judge Riethmuller said. “The amount of the underpayment, in comparison to the payments actually made, is significant. The judge said an apprenticeship was supposed to involve mentoring and training and that “in this sense, the employer is in a position of trust with respect to the apprentice”. The young man was back-paid only after the Fair Work Ombudsman commenced legal action. Mr Pulis and his company were also found to have breached record-keeping and pay slip laws and failed to comply with a Notice to Produce records issued by a Fair Work inspector. Fair Work Ombudsman Natalie James said the conduct could only be described as deliberate. “It is simply unacceptable to exploit any worker in such a way and the conduct is even more abhorrent when you consider the response the worker received for doing nothing more than asking for what he was lawfully entitled to,” Ms James said. The Fair Work Ombudsman’s newly released Record My Hours smartphone app has been designed to help vulnerable young workers such as the labourer in question. It uses geofencing technology to provide workers with a record of the time they spend at their workplace, and it can be downloaded from the App Store and Google Play. The Certificate II in Construction (CPC20112) is often referred to as a ‘Pre-apprenticeship’ course. This is because employers looking to hire apprentices frequently recruit current students and graduates. Our next course starts 30th January 2018. The course will focus developing hand skills across tiling, bricklaying and plastering. If you have been considering becoming an apprentice, but you’re not sure which trade to focus on, this course will give you an insight into several different trades as well as basic concreting and scaffolding. You will also have the opportunity to work alongside existing apprentices to find out what working in the building industry is like. The course is open to applicants over 16 years old. Government funding is available to most applicants via the State governments WorkReady programme. Students enrolled at High School who are over 16 can also complete the course under TGSS funding. The goal of this course is to help students into work within the building and construction industry. We have employers who are currently looking to hire apprentices and during the course, you will have the opportunity to be placed into work experience. Employers are generally seeking people under 21 with a drivers license and vehicle. There are employers willing to consider adult apprentices, but they are much less common than junior apprenticeships. If you would like to know more, or have any questions please contact us on 8367 5615.